Through this natural science, we have compressed thousands of years of time found in the freshness and purity of glacier waters into a few moments of time—transforming your tap water into a naturally enriched ionic alkaline mineralized thirst quencher. Your body will love it and you will too. You will be pleased to discover drinking the doctor recommended 6-8 glasses daily is much easier when your body is always wanting more. It's Amazing! As the water passes through your Q-Stream chamber, it is infused with time-releasing, alkaline pH enhancing real pearls, coral, volcanic rock and crystals containing natural minerals of calcium, magnesium, potassium, and 72 trace minerals, creating the natural alkaline foundation properties only found in Beyond O2 Premium Alkaline Oxygen Water. This infusion, like a natural flowing mountain stream, raises your water’s pH to around 9.5+ Alkalinity, making it supremely “bio-wettable” for optimum cellular hydration. As a result of naturally infusing minerals in this way, your water’s alkalinity lasts many years versus days, as in other processes. Amazingly: Natural Alkaline Rich Water Goes Deep! Water is an essential ingredient to good health and long life. By drinking Beyond O2 on a daily basis, you'll give your cells what they need to thrive. It's superb for health conscious people of all ages and it's great for pets too. Since its ionic mineral, calcium, magnesium, potassium, and 72 trace minerals, Beyond O2 becomes energized alkalized water which instantly absorbs into your body and promotes vibrant health, focus and performance. See the following: This is an actual before and after blood test showing improved vitality and health of the blood cells just after 15 minutes after drinking Beyond O2. These are the "Before" blood cells of a customer who never drank our water before. Note they are wanting to cluster and stick together and this is typical of an acidic cell environment. This is the "After"results of the same person drinking "Beyond O2 Water" showing how their HAPPY cells are 'roaming freely' just as the free ions are delivered to the blood stream in just 15 minutes. Metamorphic Transformation of Your Drinking Water! The Beyond O2 Exclusive “Q-Stream Chamber™” — The Ultimate Home Drinking Water Filtration System. This exclusive 9-Stage Purification Process with our unique Q-Stream Chamber™ (Quintessence Streaming) is the hydration foundation science of Beyond O2’s Premium Alkaline Oxygen Water Filtration Systems. As your purified water streams through the mineral Chamber, it is transformed like a caterpillar becoming a butterfly. It becomes Beyond O2! A pure, crisp, deliciously hydrating, alkaline/ion enhanced, thirst quenching experience. Through this natural science we compress thousands of years of time found in the freshness and purity of glacier waters into a few seconds of time—transforming your water into a naturally enriched ionic alkaline mineralized thirst quencher—like having a natural mountain stream right under your kitchen sink! Your Beyond O2 Water Streaming Filtration Process: Under its own natural pressure (without electricity of any kind) water streams through several uniquely designed streaming filtration chambers. Like a gentle, bubbling flowing stream, the water returns to its naturally pure clean and crisp state. Just as a flowing stream cleans water naturally, we begin by removing the largest particulates…all the way down to the final chamber where we remove any remaining sub-micron particles and toxins (This unique technique is the same utilized for desalinating ocean drinking water, and a process of water purification approved by the FDA). Now that your water is ultra-clean through this 9 stage process, (where we have removed toxins and particulates as noted below), the water gently travels through our Q-Stream Chamber™. As the water streams through this chamber, embedded with real pearls, coral, volcanic rock, crystals and 72 trace minerals, primarily calcium, magnesium, and potassium, are infused, creating the metamorphic result found only in Beyond O2 Premium Alkaline Oxygen Water. This transformation naturally raises your water’s pH to around 9.5+ Alkalinity, making it supremely “bio-wettable” for optimum cellular hydration. Some Impurities Filtered Out: Impurities ranging from pharmaceuticals, fluorides, aluminum, sand, dirt, rust from the water pipes, insects, asbestos fiber, E coli, unpleasant orders of chlorine that are used as a disinfectant and heavy chlorine by-products such as ammonia, chloramines, THM, and TCE; including a wide spectrum of impurities including various kinds of harmful chemical substances such as bacteria, virus, cancerous heavy metals, phenols, pesticides, synthetic detergents, pipe waste, industrial waste, radioactive contaminated materials, and much more, down to 0.0001 micron (25,400 microns = 1 inch). Notable Loss of flow rate indicates one or all the bottom primary filters need to be replaced. This can range from 6 months to 1 year, depending on usage and the quality of your source water. Checking pH to see if Mineral Replacement is needed – We recommend you check this every 1-2 years. Beyond O2 will notify you when it’s time to consider sending in a water sample for a free test of your Alkaline Enrichment Performance. To send us a sample, simply place ¼ cup of your Premium Alkaline water directly from the Special Spigot into a zip lock bag. Double or triple the same zip lock bag in case of breakage and put into a regular stamped envelope. Business System: 200 GPD 8,000 Gallons 10,000 Gallons Every 3 Years Pump - Passes wastewaters back through the system and are perfectly okay, simply like double washing your cloths, this assists in having about 80% less water waste. In some cases, a small clicking sound is heard. * GPD = Gallons per Day Capacity Whole House Systems…Something to Consider? 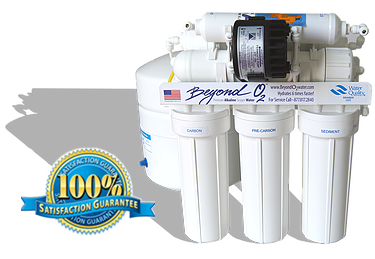 Beyond O2 now offers you the option of optimizing your home’s water experience by greatly enhancing the quality of your source water when it enters your home. Imagine the benefits of high quality toxin free water for bathing (softer skin and hair), laundering (clothing care) and dish washing (residue elimination). This will improve the overall maintenance of your systems, appliances and plumbing fixtures. For more information visit our website.